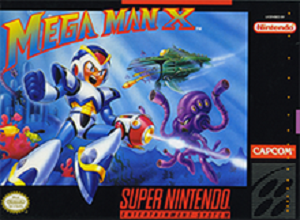 Cheats, Tips, Tricks, Walkthroughs and Secrets for Mega Man X on the Super Nintendo (SNES) We also have PRO Action replay and game genie codes. Stronger Shots – Dash while firing your uncharged X-Buster to cause the shot to deal double damage. This is useful when you don’t have time to wait for a shot to charge. Glitched Password – This password has four known effects depending on how you execute it – the password is 7443 2241 1221. Regardless of what you do, it will sound as a “wrong” password, but the effects take effect nonetheless. If you enter the password without going into the demo, the game will hang upon gameplay beginning. If you enter the black screen moments prior to the demo, then go on and enter the password, you simply start with 10 health. If you go into the demo once, then exit it and enter the password, you’ll start with all weapons, 32 health, and zero lives. Finally, if you enter the demo, wait it out, then press Start in the black screen prior to a second demo, you can enter the password to start with 10 health and all weapons. Stage Secrets – Some stages are a little different if you beat a certain boss first. If you beat Chill Penguin, the Lava in Flame Mammoth’s stage will be frozen. If you beat Storm Eagle, the lights in Spark Mandrill’s stage will flicker on and off. If you beat Launch Octopus, Sting Chameleon’s stage will be partially flooded. 2653 3858 7584 All 4 Tanks, all heart tanks, and all bosses defeated. 2137 3188 8121 All bosses except Boomer Kuwanger and Sting Chameleon dead. 2556 2582 7114 All bosses except Sting Chameleon dead. 3676 4667 5148 All powerups and armor upgrades, all bosses beaten the first time through. 5583 4618 5824 All Upgrades, All bosses defeated, 1 turbo heart. 7374 2268 6281 Beat the top half, and have collected the power ups on the top half. 5286 7136 5124 Chill Penguin and Storm Eagle dead. 5337 5377 4171 Chill Penguin, Storm Eagle, and Flame Mammoth dead. 2147 5277 1281 Chill Penguin, Storm Eagle, Flame Mammoth, and Spark Mandrill dead. 6431 5168 8171 Chill Penguin, Storm Eagle, Flame Mammoth, Spark Mandrill, and Armoured Armadillo dead plus slide ability and head capsule. 2656 5112 3164 Chill Penguin, Storm Eagle, Flame Mammoth, Spark Mandrill, and Armoured Armadillo dead. If you are lucky enough to own an action replay you can use the below codes in Mega Man X snes cheats on the SNES. If any of the codes do not work, or if you know of any that do work that I did not mention please post about it in a comment below. If you are lucky enough to own a Game Genie you can use the below codes in Mega Man X snes cheats on the SNES. If any of the codes do not work, or if you know of any that do work that I did not mention please post about it in a comment below. If you are playing Mega Man X on Snes9x (Or another SNES emulator which supports cheat codes) there are a ton of cheat codes you can use. You can basically use any of the codes listed under the Action replay codes + Game Genie Codes sections, you simply need to enter the required code as per below. Question : Can I use all of these Mega Man X snes cheats SNES Cheats? Answer : The cheats I have listed under “Normal Mega Man X cheats (SNES) Cheats” can be used by everyone. You will need a Action Replay or Game Genie to use the cheats listed on this page. Question : Do the Mega Man X snes cheats Cheat Codes Only Work In The Snes9x Emulator? Question : I know a good cheat for Mega Man X snes cheats that is no listed on this page, Can you add it. Question : Do you have any gameshark pro codes for Mega Man X snes cheats? I hope this article on Mega Man X Cheats + Action Replay / Game Genie Codes has helped you. If you are aware of any tips I have missed off please post about them in a comment below. Please help us out by spreading the word and sharing this article on Mega Man X snes cheats (SNES) Cheats + Action Replay below.